Our continued investment in you – the most important person in our practice! Our specialist orthodontist Dr Vasileios Charalampakis uses Cerec Ortho digital scanning for impressions for orthodontic treatments including Invisalign and Incognito. Our general dentists use Cerec digital impressions and milling to provide same day tooth coloured metal free crowns, inlays and onlays to improve strength, function, health and appearance of teeth as part of general dental health and smile makeovers. 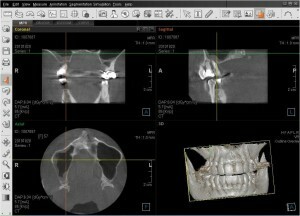 In addition to digital radiographic equipment, we have made another significant investment in you our patients and are proud that we are one of the first U.K. dental practices to offer our own in-house state-of-the-art dental cone beam computerised tomography (CT) scanner 3D imaging. This has a multitude of clinical applications including dental implant planning, and assessment of wisdom tooth/impacted teeth, gum disease and root canal anatomy. We accept referrals from our dentist colleagues in the Stroud area, Gloucestershire, the wider Cotswolds and indeed across the UK for patients to attend our practice in Stroud for their CBCT scan and then return to their usual dentist for treatment with the scan data provided either on disc or by email web link. Referring dentists for CT scans, please complete this Confident CBCT combined referral form or contact reception on 01453 764287 with any questions. 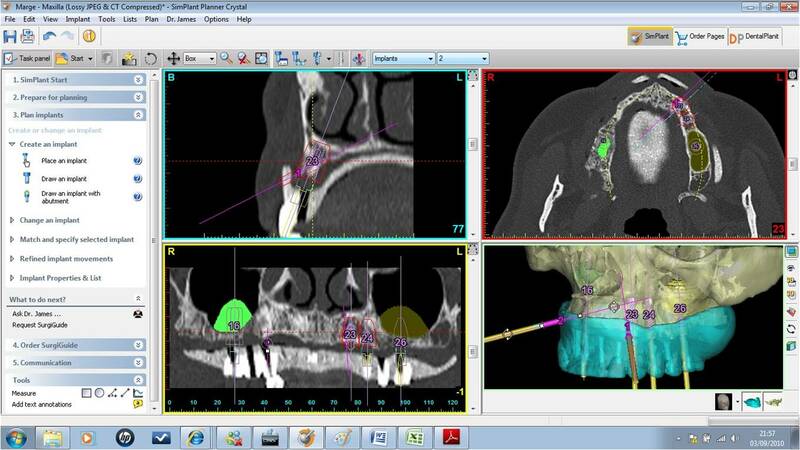 * Enables efficient, safe implant planning, especially useful where bone available is limited, with close proximity to nerves or sinus anatomy. * Enables “same-day teeth”: all-on-4 implant bridges fitted the same day as implants placed, following our expert implant oral surgeon Dr Neil’s “Fixed Teeth, Fast” protocol – the ultimate in patient convenience! * We welcome referrals from local practitioners for cone beam CT scans and can provide the DICOM format image files on disk for the patient to take the same day. Please contact us for further details on this exciting new equipment. Here is a video showing our cone beam CT scanner in situ. 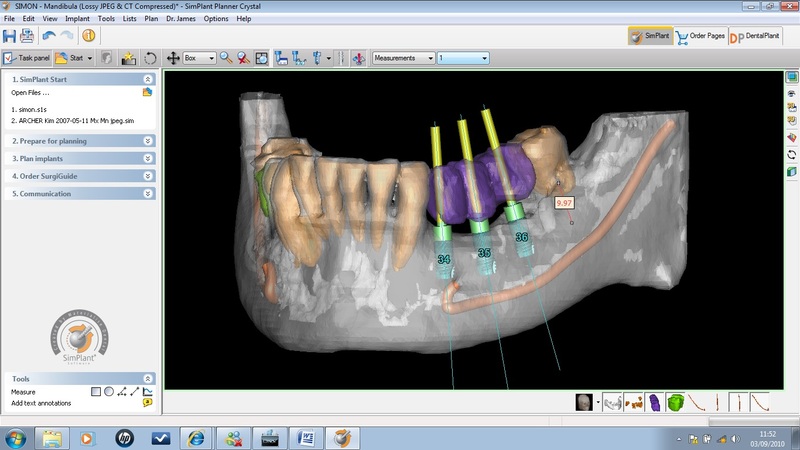 Images below show actual implant planning cases completed using specialised 3D implant planning software called Simplant by a Belgian company called Materialise. The 3D Cone Beam CT data from our scanner can be translated into the Simplant software, allowing precision planning and treatment. For more details, please click here or ask us to show you some similar cases.